Description: In November of 1983, a very unique group toured Germany, France and Belgium for a total of 14 planned concerts. The drum-less trio consisted of trumpeter and vocalist Chet Baker, pianist Duke Jordan and young Danish bassist Jesper Lundgaard. An opportunity to record this group was given to Johfu Mitsuo of Marshmallow Records who had recorded two albums by Jordan, and Lundgaard, a competent recording engineer himself, recorded these cuts on a portable Nagra tape recorder. Six of the seven cuts were recorded live without audience at New Morning in Paris and "Barbados" was recorded in Belgium the following day. 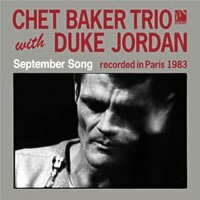 These rare recordings captured legendary Chet Baker at age 54 when he commanded huge popularity in Europe despite his substance abuse problem. His lyrical trumpet playing and intimate, somewhat frail and strangely attractive singing on this CD are representative of his performances in that period, some four years before his untimely death. Jordan plays beautifully and with authority, and Lundgaard, who would later become a giant of a bass player, provides excellent support. Recorded live in Paris, November 24, 1983. "Barbados" recorded in Belgium, November 25, 1983. This album was originally released as a vinyl LP by Marshmallow Records in 1984. The analog tapes were remastered for this CD by Johfu Mitsuo using tube equipment provided by Sun Valley. This package includes English liner notes.